NYPD said charges probably won’t be filed against the driver of a private bus who ran over and killed a man in a Brooklyn crosswalk, though it appears the victim was crossing with the right of way. Police said Martin Hernandez Tufino, 64, was crossing Avenue M north to south at around 2:11 p.m. Friday when the driver struck him with a Freightliner bus while turning right from Coney Island Avenue, according to Gothamist. The man was in the crosswalk and was caught under the bus’s front wheels. He suffered a massive head injury, horrified witnesses told police. It would not be unusual for the driver in this case to avoid penalty. Since the Right of Way Law took effect last August, motorists have injured and killed thousands of New York City pedestrians, yet as of this month NYPD had applied the law just 17 times. When I called NYPD to ask about the status of the investigation, I was told to submit my request in an email. This is routine when a member of the department’s public information staff, for whatever reason, doesn’t want to look up or give out information. Not once in my seven years at Streetsblog has an email to NYPD yielded a response. Tufino was one of at least two pedestrians killed by motorists over the weekend. 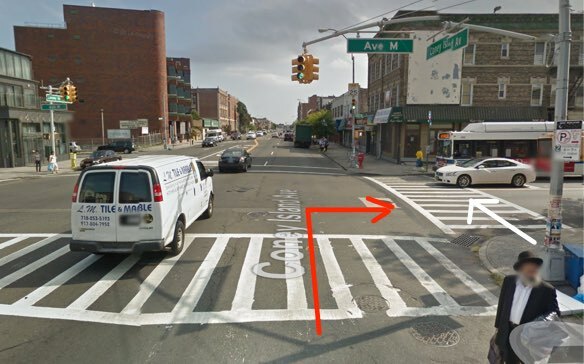 On Sunday night alleged unlicensed driver Valentine Gonzalez hit an unidentified woman at 76th Street at Woodside Avenue in Queens, then fled the scene, according to Gothamist. Gonzalez was reportedly charged with leaving the scene and driving without a license, but as of this afternoon the case did not appear in an online database of court records. Last night’s crash occurred in the 110th Precinct, and in the City Council district represented by Danny Dromm. The crash that killed Martin Hernandez Tufino occurred in the 66th Precinct, in the council district represented by David Greenfield. Not for nothing but did you get a look at that bus? How about the windows? Typical of the “private sector”, couldn’t be bothered to clean the windows. It is called “bleeding the assets”. It is the rule that proves the exception. Who was the *operator* of the Freightliner bus? I ask b/c Freightliner manufactures bus (or, more often, trucks), but isn’t a licensed operator, so far as I know. To what company or organization or individual was the bus licensed? Anyone know? Too bad NYPD have difficulties with logic. Perhaps in addition to speaking to the Daily News, the NYPD consulted with the publication’s editorial board before deciding not to arrest a driver who killed a pedestrian in a crosswalk. The bus is used (not sure if they are the actual operator) by HASC (Hebrew Academy of Special Children), which deals with mentally handicapped and developmentally disabled. At the time, the bus had twelve passengers that had been moved into a funeral services home during the accident investigation. Further review of images shows the bus labeled as “HASC Transportation Corp”, a likely subsidiary. It should be possible to file charges against the NYPD for this sort of dereliction of duty. Well, actually, it *is* possible — the DA can do it. Which brings us back to the DA elections…. Thanks for mentioning the guilty police precincts (it’s worth noting the names of the precinct captains too) and the City Council districts. It also may be worth mentioning who the responsible DA is (in this case, Ken Thompson) — Ken Thompson actually seems to be by far the best of the five DAs in New York so far, because he’s actually managed to indict *one* of the high-profile killer cops. Now, Thompson being the best of the five is pathetic! It speaks more to how awful the other four are than anything else.